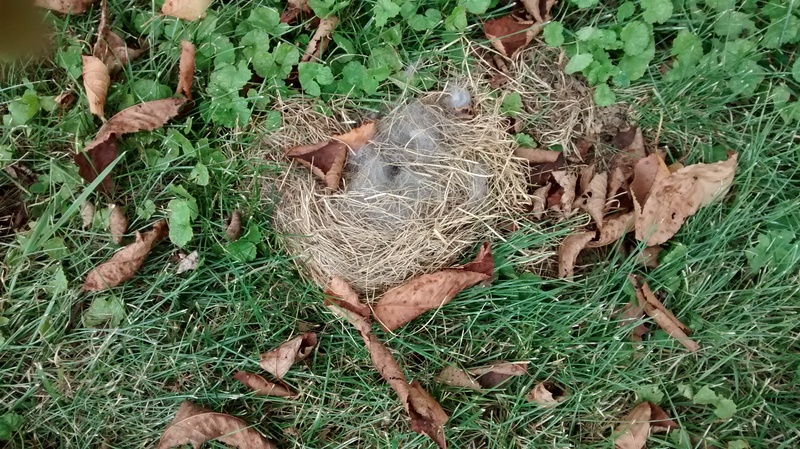 Walking around in my side yard, I found a rabbit’s nest. The mother rabbit will use a depression in the soil, or dig a little hole. Then she covers it with grass or leaves that she finds around there, and pulls some hair out of her belly too. I took a stick and brushed the top of the hair, and the pile of stuff moved up and down. Ah ha, they’re still in there! Then I took the stick and separated some of the hair, using the stick so I could see in without getting any of my scent on the nest material. I thought maybe I could get a picture of one of them, but they hugged up against the sides of the hole quickly. I disturbed it a bit more and did see two, maybe three, little babies, maybe 2″ long with their little ears folded back. Then I quickly covered them back up and went away. I had seen a rabbit laying down that way last night, but we have a lot of rabbits around here and they often lay around in the yard, so I didn’t think of a nest. Baby rabbits are on their own a lot, and I read that the mother only comes back to the nest two times a day at daybreak and dusk, to nurse the babies. She stays for 5 minutes and they can be fully fed in that time. Years ago I found 4 babies basically laying in the yard in a pile of grass and hair, with no hole dug and no real protection or concealment. (I guess some rabbits are smarter than others. Maybe she was a new mother.) I called my vet then to ask about rescuing them. He said they were best left alone, and were probably not abandoned, that she would come back. He also said that baby rabbit mortality is about 50%. They get eaten by hawks or feral cats, hit with cars, etc. He also said you can’t give them cow’s milk cos it will kill them, and there is a wild animal formula available but they don’t do well even with that when humans try to rescue them. Nature is nature, and it’s best to let it take its course in the case of baby rabbits. The cycle goes on. It’s lucky for these that the grass has stopped growing and we’re not mowing now, cos it would be easy to miss this little pile of fluff when somebody is mowing. Good luck little rabbits. It’s rough being a baby rabbit. Added the next day: Eliza took this picture this morning. 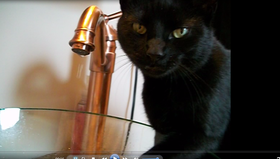 3 sets of ears here………. 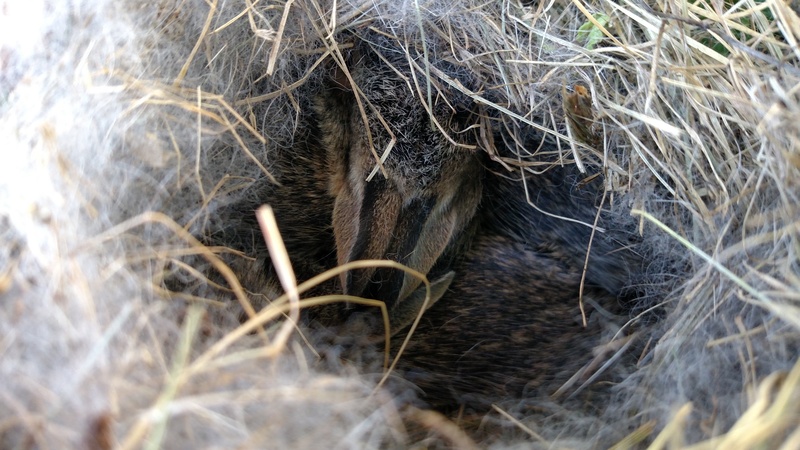 Added later: several days later the baby rabbits came out of the nest. 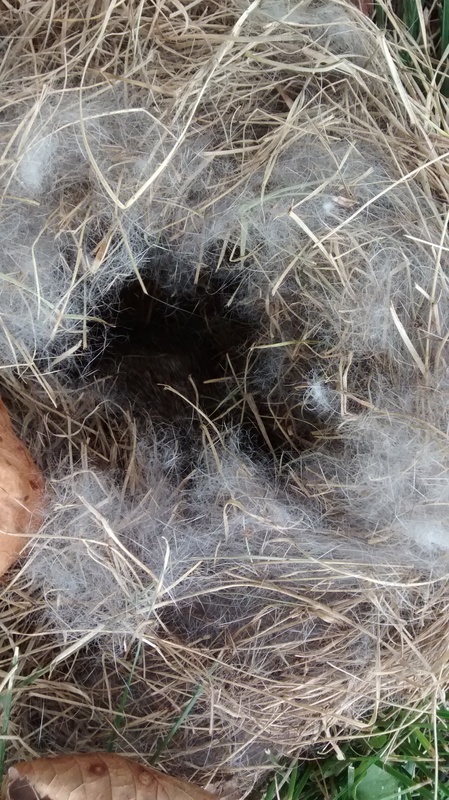 The mother rabbit chose to put her nest fairly close to the street out in the front, and I hope the babies had the sense to run away from the street noise, to the back of the yard and toward the woods or at least in the bamboo. One hung around between the pots with hot peppers in and under the sage plants for several days. I spooked him out of there several times when I watered with the garden hose, and he went back in his hiding place afterward. We see a lot of baby rabbits around every year, and when we stop seeing them I always hope they have gone up to the field and woods where they can be mostly protected from hawks and a couple feral cats that travel around here sometimes. Hello. Those are great pictures of a rabbit’s nest. Would you mind if I used them in a Facebook post for DFW Wildlife? I would certainly give you credit for the photos. Thank you for considering. No I wouldn’t mind at all! Can you show me where they will appear? I don’t know what DFW Wildlife is. Glad you liked them! Thank you! I ended up just using the uncovered nest. Here’s a link to our page where you can see the post. Thanks again! That’s great and thank you for the credit. I’m glad it was useful for your group.